Unlit spaces always attracted my photographic attention. I found Troy at night to be awesome: a giant collision of interesting people doing interesting things. In a single night, one could spend hours in alleys, bars, dance parties, rail yards, and encampments. Newly available high quality digital cameras allowed me to take hundreds of photos in a night…a few came out great. One night, I saw someone with a flash on a cell phone camera. Soon photos were streaming in from the bars and parties. It was time for a new challenge. A mass of iron passing in the night is a haunting experience. It is also an experience that is difficult to photograph. Photographing trains at night allows me to bring people images of activity at night few are able to see, most just hear the horn from a train in the distance. Throughout my time in Troy I’ve been interested in its walkable downtown, historic buildings, and industrial past. First, my then-girlfriend and I moved into a row house and started fixing it up. Eight years later, with that under our belts, we (now married) bought the large industrial building adjacent to our home. Subscribe to our Weekly Newsletter. 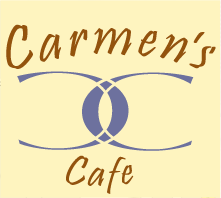 Bringing you Specials and Events from Carmen's Cafe.